Ben Anderson speaks on mobile apps at Ignite Dealer Summit on September 7th in Minneapolis. 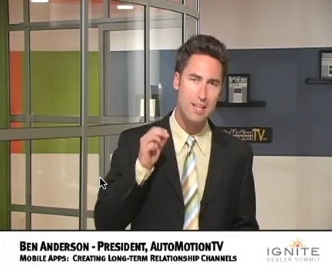 AutoMotionTV Dealer App President, Ben Anderson, will be speaking on mobile apps at the Ignite Dealer Summit on September 7th in the Twin Cities. The Ignite Dealer Summit will be held at the Hilton Minneapolis/St. Paul Hotel and is set to help dealers fire up their marketing for maximum results in an era of rapidly advancing digital technology. On the Summit’s agenda: Workshops, breakout sessions, keynote speakers, breakfast, lunch and a cocktail reception. All with a rock star lineup of leading industry experts, plus an exhibit hall with top-shelf digital companies, new product demonstrations... and prizes. It's energizing, innovative, fosters networking and, of course, provides cutting edge information. Ben Anderson’s session titled “Mobile Apps: Creating Long-term Relationship Channels with your Customer” will cover ways in which dealers are using mobile and dealer apps to capture, convert and retain customers on the go. Takeaways from Anderson’s session will include: When to invest in mobile marketing, how quality mobile apps can create long-term relationship channels with your customer, tracking your results, and mobile best practices from top dealers. “The time to start investing in mobile is now,” Ben Anderson declares. With mobile traffic on the rise, more and more dealers are evaluating their mobile strategies. 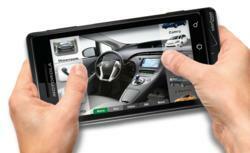 Mobile is an essential topic for dealers to discuss and emphasize. AutoMotionTV develops innovative mobile marketing solutions for the automotive industry. Engage and establish a long-term relationship channel with your customers from initial information to repeat service. The AutoMotionTV Dealer App is a laser-focused communication channel to your customers. Engage your customers directly and convert a casual prospect to a repeat customer from sales to service via an iPhone and Android mobile app. AutoMotionTV works hand in hand with each dealership to successfully launch and promote every Dealer App. Ben Anderson is the moderator for “Mobile Marketing and the Dealer”: A weekly video series interviewing key influencers in the dealership market on mobile marketing best practices. Ben is the president of AutoMotionTV and a nationally known marketing entrepreneur.